The Internet and digital boom has led to many a star being born. YouTube was responsible for facilitating Justin Bieber’s discovery and metoric rise, while Myspace had a helping hand in jump starting Katy Perry’s singing career. Now, SongBooth wants to discover the next musical sensation by providing a social-mobile platform for collaboration and engagement among musicians. The design of SongBooth’s mobile app echoes its musician-minded attitude. You could say that SongBooth, which launched to iPhone and iPod Touch devices earlier this month, sort of looks like a portable stage for impromptu concerts. There isn’t much here for the listeners — the, ahem, less-than-musically-gifted — among us. You might enjoy browsing through clips of performances published to SongBooth, but otherwise there isn’t much for you here. But if you’re a musician, SongBooth can be a haven away from YouTube, where audiences typically don’t take kindly to anything less than perfect performances. The app is still in its infancy so its community is tight-knit and willing to dish constructive criticism. Or if they’re appreciated, users can engage with musicians through feedback features that come in the form of likes and comments. 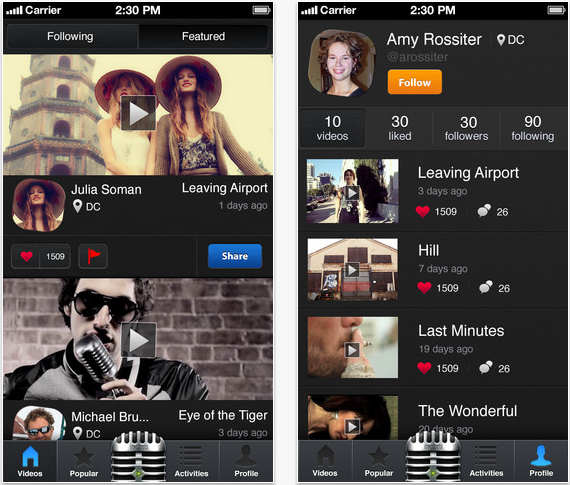 And in-line with these features is the option to share a video through Facebook, SMS, or email. Twitter has yet to be integrated. SongBooth’s videos run surprisingly fluidly without much interruptive buffering. Navigation is also easy to manage, and there are five simple buttons to help you dive into the app. The first two labeled, “Home” and “Popular” are for now filters that surface different types of user-uploaded content. The far right button labeled “Profile” is your personal profile page where you can view your own published videos, and see who is following you or liked your content. Next to this button is an “Activities” button which acts as a sort of news feed for Songbooth. 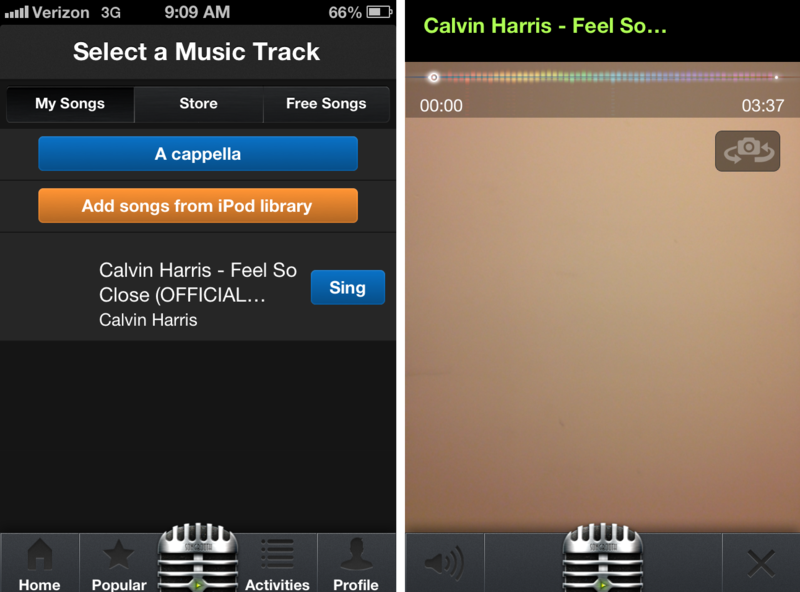 The central button, which looks like a mic, is what differentiates SongBooth from other video sharing apps. Users aren’t just uploading videos of themselves, they’re singing or playing an instrument with the expectation that the community will be judging them for better or for worse. When you click on the mic, a page opens up where you can select tracks. This is where you would tinker around with the instrumentals or pre-set songs that you’d like to accompany you. Right now you can only pull in a preexisting track from your iOS device, SongBooth CEO Gregory Lowe has every intention of adding additional instrumentals in a future update as an in-app purchase. Free music will also be offered. There are a couple of incentives for musicians to pick up this app and start practicing their vocals. For starters, SongBooth is backed by YouTube singing sensation Ryan Beatty and renowned R&B singer Miguel, so there are at least a few industry leaders watching these videos. More importantly, SongBooth says that a yearly contest will be hosted, from which the most popular musician using the app could win a recording contract. One piece of advice from us is that since SongBooth may be a sticky app among singers, we’d recommend that if you’re going to invest some time in it, go out and buy a mic for your iPhone. While the iPhone’s sound quality isn’t terrible, it’s far from the studio quality that makes a considerable difference — and if you’re trying to net a record deal with an app, any advantage can’t hurt.